The profession of Design is about to drastically change. If you’re an architect, engineer, planner or builder, the way you build is about to undergo some radical new transformations. 2012 is on track to become the warmest year on record, with some 40,000 temperature records broken in the United States this year alone. In addition, Arctic sea ice melted to a record low this year, further adding to a grim list of milestones and warning signs that most people are ignoring. Both candidates running for President failed to once mention Climate Change during the 4-1/2 hours of debates. This is the first time since 1984 that has happened, and a sign that the carnival that has become our election process is unable to focus on what is truly important. 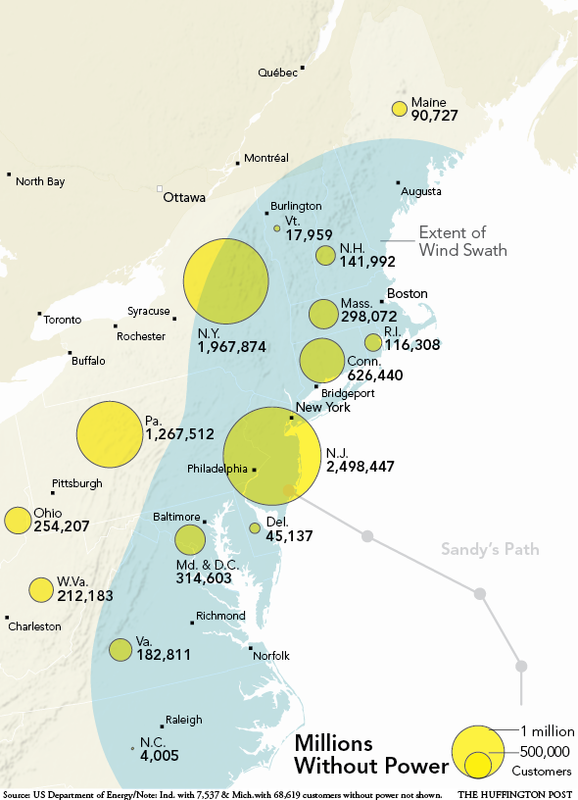 Huffington Post map of Hurrican Sandy power outages in Eastern U.S.
Hurricane Sandy highlights the extreme vulnerability of our transportation and electricity infrastructure. To millions, climate change suddenly just became very real and very expensive. The Atlantic has a wonderful map showing the (still) flooded areas of New York as a grim predictor of things to come. With economic losses of up to $20 billion, Hurricane Sandy is the disaster that could finally wake everyone up from their stupor. This would make it the costliest hurricane to ever hit the Northeast, and perhaps what is needed to change our policies to address our climate. According to the Philadelphia Inquirer, power outages in New Jersey and Pennsylvania have “shattered records” with over 3 million without power. In New York City, their transit system carrying 5.2 million passengers a day and essential to the city’s economy is flooded. The Wall Street Journal reported on the corrosive effect of flooding salt water on subway tracks and tunnels. Thanks to an already rising water table, the MTA’s 300 pumping rooms daily remove around 13 million gallons of water from their network of tunnels, and that’s on a dry day. The flooding caused by Hurricane Sandy could take up to four days to to pump out, according to MTA officials. A week before the Hurricane, the Center for Biological Diversity awarded their “Rubber Dodo” award to Oklahoma Senator James Inhofe. If you want to help the millions affected by Hurricane Sandy, I urge you to sign this petition and also donate to the American Red Cross. Eric Corey Freed is principal of organicARCHITECT, an architecture and consulting firm in California, and author of four books including “Green Building & Remodeling for Dummies”. Great article, Eric. Thanks for the links to other articles and resources. I hope it’s not too late. Thanks for the post, Eric. Its tragic that neither candidate addressed climate change in the debates. As a species we only change when we have to… a few more Sandy’s and we will have to..
One can only hope that given what has happened to gulf and now, to the New Jersey and the 15 or 16 other states affected by Sandy, that the warning would be heeded. If the US isn’t going to make efforts to first ACKNOWLEDGE the problem and address it, it’s going to have to be up to developers, designers, builders and planners to take the lead. They have to, some degree, done it New Orleans with buildings that adapt to flooding. Excellent, excellent article. One can only hope that given what has happened to the Gulf region and now to New Jersey and the 15 or 16 other states affected by Sandy, that thewarning would be heeded but political intransigence once again gets in the way. If the US isn’t going to make efforts to at least ACKNOWLEDGE that climate change exists and address future catastrophes, then it’s going to have to be up todevelopers, designers, builders and planners to take the lead. They haveto, some degree, done so in New Orleans with buildings that adapt toflooding. Excellent article but maybe too much to expect presidential debate/campaign to cover any topic in great length, even one as important as global warming. Hopefully with time, awareness, and experience, change will happen in the building industry and United States. Eric, thank you for the great article here. And I’m very glad to learn about your books. I’m currently planning to become “energy independent” at my home and office. So, I will definitely check out your books and website. I keep meaning to read McKibben’s Rolling Stones article. Thank you for bring it back to the forefront and hopefully helping others find it as well. If this is the most important issue in the history of mankind, it is being met with a collective yawn. One has to wonder what event will spur enough concern that Americans will drop their Doritos Locos tacos and demand action? I suspect that time is a ways off with one television network consistently controlling 20% of America’s mindshare, and influencing half the country. Can we improve the situation in this climate? (No pun intended). But we must remain advocates, nonetheless.